As everyone reading this assuredly knows, Colin Kaepernick renewed public discussions about the role of politics, protest, and activism in sport. This debate has surely picked up steam in the past couple of weeks with involvement from the Executive Branch. Casually browsing social media, I regularly encounter opinions on the matter that are quite frankly ridiculous. These commentators typically ascribe to the “stick to sports” idea that nobody connected to sport – players, coaches, journalists, or even fans – is allowed to do anything other than play, manage, describe, or cheer the athletic competition at hand. As any historian knows, politics and sport are thoroughly entwined. Some of America’s most obvious sporting heroes like Jackie Robinson and Muhammad Ali were deeply political individuals who connected their athletic career to their political activism. As the right demonizes NFL players for their anthem protests against police violence and for racial justice, plenty of commentators pointed out the legitimacy, the necessity, and the bravery of player protests as complex expressions of American freedom and patriotism. Others pointed out the hypocrisy coming from those on the right who were in effect demanding their own “safe space” at football games and that the NFL had already been politicized by collaborations with the Department of Defense. One of those aforementioned social media acquaintances shared a talking point I had not yet heard. He argued, wrongly I might add, that sporting protests are exclusively a post-WWII liberal phenomenon stemming from the Civil Rights Movement. The argument quickly fell apart, but its simple presence indicates that some people believe it and disseminate it widely. Stemming from a mythologized American sporting past, this argument would have us believe that sports prior to 1941 were an oasis where competition was divorced from conflict. Many others presenting this argument point to pre-WWII baseball, conveniently ignoring the fact of segregation, as an example of when sport was apolitical. Sport historians know this is a ridiculous point – segregation itself was an expression of politicized sport – but even these lily-white baseball clubs of the nineteenth and early-twentieth century expressed their own version of (usually conservative) politics. Just to give a few examples, let’s look at amateur baseball clubs throughout Virginia and West Virginia from 1865 through the 1930s. In short, every documented baseball club during this time and place with which I am familiar was in itself a political expression both on and off the diamond. Immediately following the Civil War, the former capital of the Confederacy, Richmond, Virginia, embraced the dual notion of reconstruction and reconciliation. Reconstruction (and later the New South Creed) generally involved embracing Northern-style capitalism to both rebuild the city and to legally recreate hierarchical economic conditions of the pre-war economy. Capitalism brought with it migrants from the North, and along with these migrants came cultural products, not least of which being the new American pastime – baseball. Richmond booster capitalists took an interest in the game for all it could do in shaping the city’s image as a progressive, modern city open for investment. 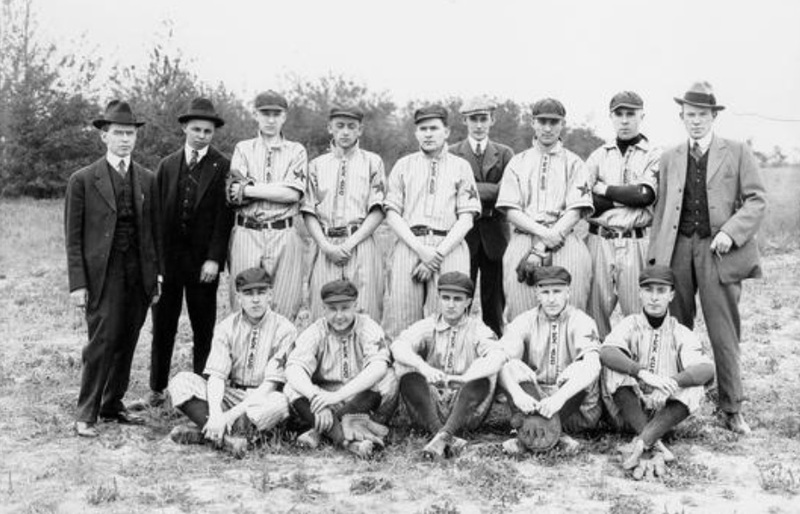 Texas Company baseball team, undated, likely around Norfolk, VA. Harry C. Mann Collection, Library of Virginia. As early as 1866, Richmonders shaped baseball to fit their own political aims – pro-Confederate sentimentality. City newspapers regularly assured readers that visiting clubs from Washington D.C. and Baltimore consisted of Confederate veterans so that anyone attending the game would give them a warm welcome. In 1866 and 1867, nearly a dozen clubs formed named in honor of the Confederacy, including Jackson (named after Stonewall Jackson), Robert E. Lee, Mosby (after John S. Mosby), Stuart (after J.E.B. Stuart), Secesh (slang for Secession), and Dixie. Some of these clubs made their pro-Confederate politics even more explicit by refusing to play teams with Union veterans in their lineup. This was unusual even for the time as plenty of clubs forming in West Virginia at the same time named for Confederates included both Confederate and Union veterans with no problem. By the early-1880s, Richmond baseball had been fully incorporated into the growing Lost Cause public culture of reconciliation. A day-long Confederate celebration on September 4, 1883 ended with a baseball game between Union and Confederate veterans (of course the Confederates won). According to historian Richard Gudmestad, this was but one example of how club directors consciously used the team to simultaneously promote both Richmond and a Lost Cause version of the Confederacy. The club played games in support of needy Confederate veterans, explicitly invited veterans to attend games in front-row seats, and regularly booked the Stonewall Brigade Band from Staunton to play before games. There was no question – to support Richmond baseball was to support the Lost Cause – and that’s exactly how the team wanted it. In 1890s Clifton Forge, men formed an amateur ballclub with no financiers just because they wanted to play ball. Within months though, the team captains, newspapers, and local business leaders all used the club as a ploy to reshape town image away from that of violent racists to “gentlemanly” New South capitalists. In the early-1890s, white residents murdered three black men, earning the scorn of the Virginia governor, and forced hundreds of African Americans to flee the area in search of a life elsewhere. As part of local efforts to bury this recent past, the baseball club began to emphasize “gentlemanly” player behavior both on and off the field long after it had fallen out of prominence nation-wide. Local newspapers supported this idea as well by linking the club’s positive behavioral qualities to the town broadly. Another example is how unlike other cities the club placed a high emphasis on recruiting talent from within city borders as a method of “proving” to other locales just how rehabilitated local men had become by the mid-1890s. Either way, it didn’t work. The economic boom fueled by railroad expansion never came to the town as expected. 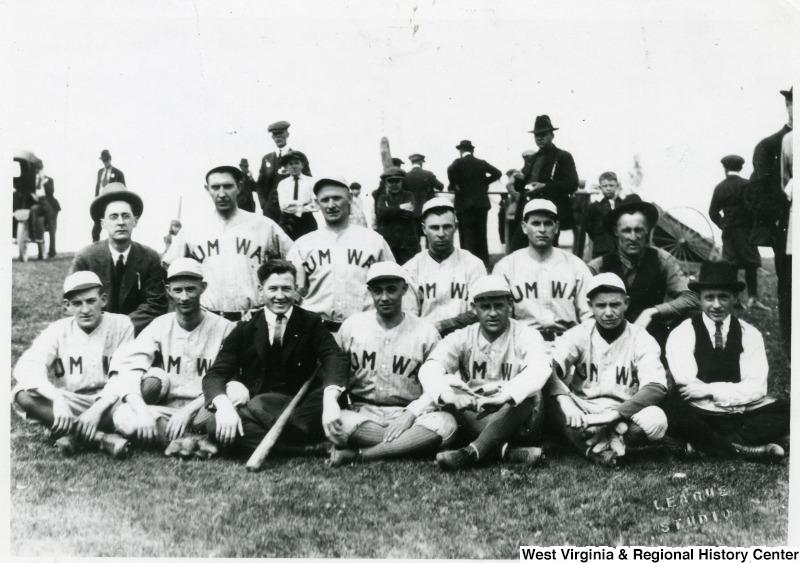 By about 1910, baseball and prohibition became interconnected in West Virginia politics. Prohibition laws came to the state in 1914, six years before the Eighteenth Amendment, with a majority of counties (37 of 55) being dry as of 1910. A few ballclubs used their games to campaign in favor of prohibition prior to its codification, such as the Fairmont “Prohibs” naming themselves as such in honor of a local anti-liquor statute in the late-1910s. Billy Sunday himself based his evangelical anti-liquor operation out of Wheeling for two months in 1912 to campaign for West Virginia prohibition. Part of Sunday’s approach was to politicize his baseball past to more effectively deliver sermons, for example deploying excessive baseball metaphors to more easily connect with the public. Most clubs though campaigned against prohibition for two reasons: to retain beer sales at games, and because prohibition was usually connected to statutes barring Sunday baseball. Virtually every team in the North Central part of the state outright disbanded in 1913 after bans on booze and Sunday ball went into effect. This was in part out of protest hoping that local fans would recognize there could be no baseball leagues without beer sales or Sunday games. A similar incident occurred in 1911 Point Pleasant, but instead of disbanding team owners simply moved the club to Ohio to dodge prohibition laws. Baseball was popular in the coalfield regions of these states as well and powerful corporate forces involved themselves in the sport by at least 1920 as both a public relations ploy and method of social control. The Battle of Matewan and the Battle of Blair Mountain occurred in 1920 and 1921 respectively and coal companies feared that further labor unrest would lead to another uprising. Companies throughout the region sponsored teams and leagues ostensibly so company town residents would have an entertainment outlet for Sundays, the one day a week off work miners received. Coal barons built ball fields, commissioned jerseys, and purchased equipment for the men and it was common knowledge that some miners were likely hired effectively to be ringers. These companies had a vested interest to field successful teams because they designed baseball to be an advertising tool and a method to keep miners happy. By the mid-1930s, the United Mine Workers of America (UMWA) regularly sponsored teams and leagues as an effort to tap into the companies’ recruitment methods. However, as UMWA membership increased post-Depression, many coal companies disbanded their ballclubs in protest of coalfield unionization. In short, by refusing to support clubs made up of union workers, these companies further proved their involvement in baseball leagues was a political ploy from the start. As can be seen, there ain’t no such thing as apolitical sport here, there, or anywhere. Dozens of other examples from Staunton, Charlestown, Charlottesville, Blacksburg, Pennington Gap, Beckley, Morgantown, and Bluefield would further demonstrate the long-standing connection between politics and baseball from the sport’s earliest days in the Virginias. The linkage of politics and sport is not a post-war or a liberal phenomenon – it’s just how it is and always has been in modern American sport. Josh Howard is a public historian and co-founder with Passel Historical Consultants. Such naming conventions continue into 2017 statewide with teams such as the New Market Rebels and Robert E. Lee High School Fighting Leemen. Ryan Swanson, When Baseball Went White (Lincoln: University of Nebraska Press, 2014), 121-122. William Akin, West Virginia Baseball (Jefferson, NC: McFarland, 2006), 10. Robert H. Gudmestad, “Baseball, the Lost Cause, and the New South in Virginia, 1883-1890,” The Virginia Magazine of History and Biography 106, no. 3 (1998): 267-300. Wendy Knickerbocker, “The Baseball Evangelist Throws Out John Barlycorn: Billy Sunday and Prohibition,” in The Politics of Baseball, ed. Ron Briley (Jefferson, NC: McFarland, 2010), 32. Crandall Shifflett, Coal Towns (Knoxville: The University of Tennessee Press, 1991), 162-165. 12 October 2017 in Josh Howard.